Solving the battery problem, one annoying bus stop at a time. The problem with electric cars (and buses and motor scooters) isn't making an engine that runs without gasoline or supplying enough horsepower. No, the technology for all that works great, the problem is that batteries have not advanced as quickly. There is not a way for a vehicle to carry a battery that will hold enough charge to travel very far; a battery big enough would be too heavy for the vehicle to carry. Smaller vehicles like cars can get away with what batteries are available now because it's not often that people have to travel more than 100 miles per charge. But with a mass transit bus in a major city, the power needed to even go a few miles is way more than a battery can hold. The Fraunhofer Institute in Germeny has a novel way to get around this particular conundrum, however, by setting up a charging station at every bus stop that will jolt it with up to 750 volts of power with a mere 30 second charge. "We wanted it to be flexible and rather cheap like a bus system - less expensive than light rail. One way we achieve that is not to have any overhead line, or rails," said Ulrich Potthoff. 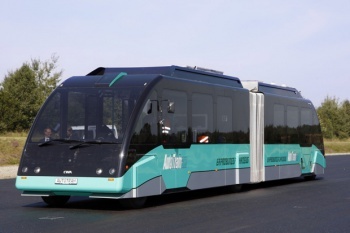 Enter the AutoTram, a light-weight segmented bus/slash tram that will dock with a passenger platform to receive a burst of electricity capable of powering the vehicle up to 1.2 miles. That doesn't seem like a lot, but with distance between bus stations averaging around .3 miles in Germany, such a distance is more than enough. "I think this is most useful in countries which only have diesel buses and want to do something new with transportation," Potthoff said. "They are calculating that overhead lines and infrastructure is very expensive compared to our system." If the prototype Potthoff is building works, he thinks that he will be able to reduce the emissions and costs of public transportation as compared to light rail systems, but that it will still be pricey compared to diesel bus lines. "If it's not subsidized for environmental reasons, you would not be able to calculate in an equal way," he said. Also, if my time playing Cities in Motion has taught me anything, a tram line that doesn't need an overhead wire or rails would be pretty awesome.